The Texas Star herself—Miss Lily Dare, the “fastest woman in the world”—is bringing her Dare Devils Flying Circus to Darling. Unfortunately, she’s also bringing a whole lot of trouble. As the Dahlias prepare for the annual Watermelon Festival—where they will present the famous female aviatrix with her own Texas Star hibiscus—rumors are flying. Dahlias president Liz Lacy learns that Miss Dare has been threatened and her plane sabotaged. Apparently the bold and beautiful barnstormer has made plenty of enemies. And is it possible she may be involved with the husband of one of Darling’s local ladies? The Darling Dahlias and the Texas Star is the fourth installment of Susan Wittig Albert’s series set in 1930’s Alabama. This installment continues to follow the “Dahlias”, an eclectic group of ladies from Darling, Alabama who run the local garden club. The girls, headed by club president Liz Lacy, find themselves in the midst of a mystery surrounding larger-than-life Miss Lily Dare, a female airplane daredevil in town for the highly anticipated annual Watermelon Festival, which the Dahlias are running this year. In every Dahlias novel, the story revolves around not just one or two members of the garden club, but many of them simultaneously. Liz and Verna are, as usual, the central characters. Liz has developed wonderfully over the course of the novels. She is kind and independent with a wild imagination that often leads her down the wrong track when she is trying to puzzle out a mystery. Verna is as practical and dry as ever, but still lovable in all her competency. This installment has lots of little sub plots that run concurrently with the central mystery and that bring the story to life with heart and soul. I love that the story of Myra May, who runs the local diner and telephone exchange with her roommate Violet, takes a more prominent role in this book. I’ve been longing to learn more of her back-story for a while now and was very satisfied with what was revealed. All of the other inhabitants of Darling that I’ve come to love are also given time in Texas Star, including Mildred Kilgore, whose marriage takes center stage in this book. Fannie Champaign, who is fairly new to Darling and is still rather mysterious, adds a dash of romance to the story as we look into her relationship with another newer character, newspaper owner, Charlie Dickens. 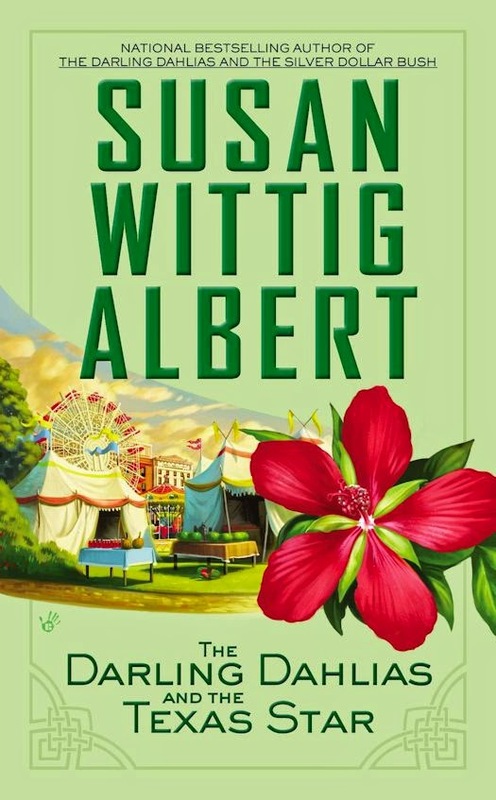 I have been a huge fan of Susan Wittig Albert for a number of years now and have absolutely loved everything I have ever read of hers, including this novel. Wittig Albert crafts wonderful mysteries that are heavy on the interpersonal relationships of her characters. This fact is important when reading her various series. I would highly recommend they be read in order so the reader can appreciate how the characters and relationships have evolved over the course of the series. The author always incorporates amazing local charm into her books, whether she is writing about a fictional herb shop in Texas, the setting of her long running China Bayles series, or a small southern town during the Great Depression, as in the Dahlias series. She gives her settings such liveliness that they are almost another character in and of themselves. In Texas Star, the period details are superb, which is consistent with the first three books in the series. Wittig Albert is a seasoned cozy mystery veteran who never ceases to deliver intriguing mysteries and lovable characters that seem to grow organically and true to life. I am eagerly awaiting the next Dahlia installment, The Darling Dahlias and the Silver Dollar Bush, which is sure to be another gem.